Dan grinned and jumped to herd Trixie in the right direction. As he touched her arm, his grin vanished, and Trixie felt his grip tighten on her arm. "What's the matter, Dan?" Trixie asked. Glowering at her, Dan yanked her toward Honey and seized her arm, too. He raised it toward his face. "Dan?" Honey asked in an alarmed tone. "You crazy kids!" Dan snapped. "You've been smoking marijuana!" "Don't lie to me. I know the smell of it. I can smell it on you!" Regan's face quickly flushed with anger, matching Dan's. The yard filled with the sound of accusations and protests. The clamor brought Miss Trask hurrying from the house. The boys were shouting. Honey was crying. Trixie was on the verge of tears herself. Miss Trask put her arm about Honey. "That's enough! All of you. What's this all about?" "Can't you smell it?" Dan demanded. "They've been smoking marijuana!" The Mystery of the Unseen Treasure (p. 173-174). The ghost writer of this book is believed to be Carl Henry Rathjen. 6. A Series of "Accidents"
A ride at the start of the summer holidays leads to mystery when the Bob-Whites see a man pouring gasoline on the shed of a kind neighbour. Trixie is determined to find the culprit who is trying to destroy the small business of Mrs Elliot and they stumble across a marijuana plantation and find themselves having to prove their own innocence. Trixie manages to uncover the truth with the help of a retired policemen and a good idea reveals a hidden treasure. Al Finlay - Dan knew of his from his New York days and he had some dealings with Mrs Elliot's dead husband, Sam. He tries to ruin Mrs Elliot's business and force her to sell her property to him. This is a well written and researched book with no obvious inconsistencies. It is summer time again and the Bob-Whites have just finished school. The book commences in June. Brian is seventeen years old. Mrs Belden reveals that Ethel Elliot nee Rogers used to be her baby sitter when she was younger. Trixie is mad when Brian offers to drive her around the lake, instead of going with Sergeant Molinson. 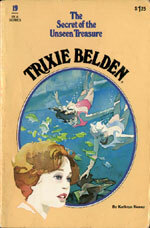 Brian tells her that because she is no longer a girl, but a young woman, Molinson must be accompanied by a female policewoman to ride with Trixie (p. 71-72). Charles Hartman is a lively old man who had retired from the Albany police force and is still very much in love with his wife, who he refers to as his bride. June turns into July and Brian and Jim leave to work as counselors at a boys camp. Strangely enough, Mart doesn't go but Dan now has his driver's license and drives the Bob-White station wagon (p. 87). Dan accuses the Bob-Whites of smoking marijuana in an emotional scene that has Honey in tears and everyone else angry and upset (p. 174). Trixie has a useful ally in Charles Hartman and they work well as a team. It would have been nice to see him appear in later books. I think he would have enjoyed the challenge.